TACOMA — Hockinson. History. Hand in hand. “This has never been done in Clark County,” Sawyer Racanelli said. 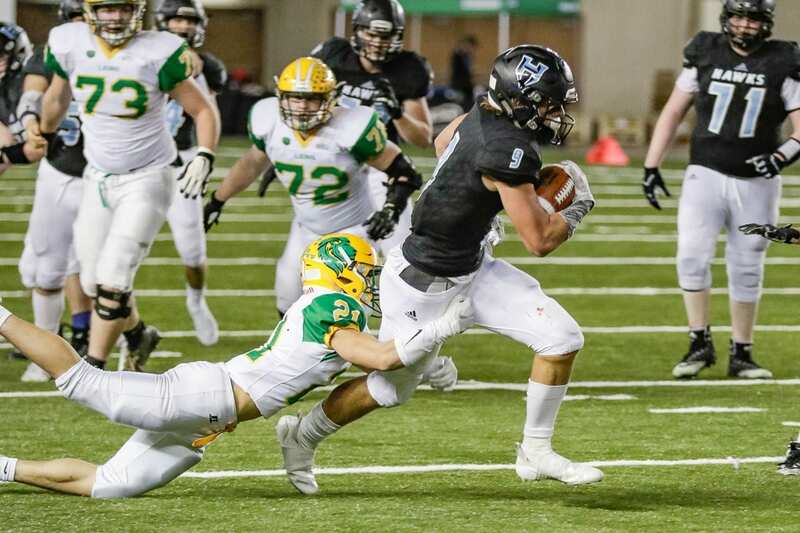 Racanelli rushed for a championship-game record five touchdowns as Hockinson rallied from a 17-point second-half deficit to beat Lynden 42-37 on Saturday afternoon, clinching the Class 2A state high school football title. 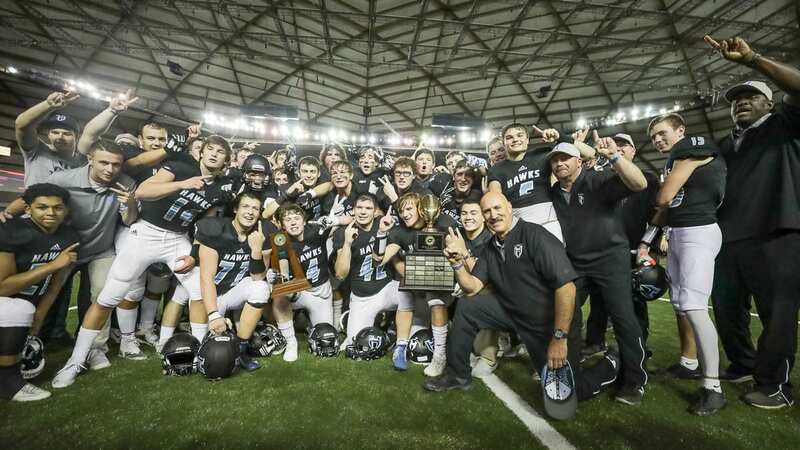 The victory gives Hockinson back-to-back football championships, the first team from the county to accomplish that feat. The Hawks completed a 13-0 season to make it 27 consecutive wins, the longest streak in the state in all classifications. The way the Hawks did it will be remembered as well. A week after coming back from 17 points down in the semifinals, the Hawks did it again in the championship game. They also had to go away from their usual incredible passing game and opt for a running attack. Racanelli scored five rushing touchdowns, all in the second half. A wide receiver, he is the team’s quarterback in the Wildcat formation. The Hawks dared the Lions to stop him, and the Lions could not. Oh, Racanelli also threw a touchdown pass to quarterback Levi Crum in the first half. Both of those players gave credit to God, and then they credited their teammates and their fans. Garrett Gundy is one of 14 seniors on the Hockinson squad. Then they won it and got this opportunity to repeat. It just took the Hawks a little bit to get going Saturday. Lynden scored on its first three possessions of the game, took a knee for a play just before halftime, and then scored on its first drive of the second half. Just like that, it was 24-7 Lynden. Steele said he and the coaching staff always believed. “We weren’t playing bad. We just weren’t playing well,” Steele said, adding that he felt his team was in a decent spot trailing only 17-7 at the half. Even after the Lions scored quickly in the second half, the Hawks were confident. Something good did happen. And that momentum did get going Hockinson’s way. The Hawks went 75 yards on 11 plays, with Racanelli scoring on a 4-yard run with 3:50 to play in the third quarter, making it 24-14. Less than a minute later, the Hawks recovered a fumble. Five plays later, Racanelli scored on a 3-yard run to make it 24-21. Aidan Mallory, who had a pick-six in last year’s title game, intercepted a Lynden pass on the ensuing possession. His 30-yard return set up the Hawks to take the lead. They did it on a 7-yard touchdown run from Racanelli early in the fourth quarter. There would be a couple more momentum shifts, though. Lynden returned the next kickoff 81 yards, setting up a 13-yard touchdown run by James Marsh to give the Lions the lead again, this time at 31-28. By then, though, the Hawks had something going on offense, and with 10 minutes to play in the game, they knew they had plenty of time. 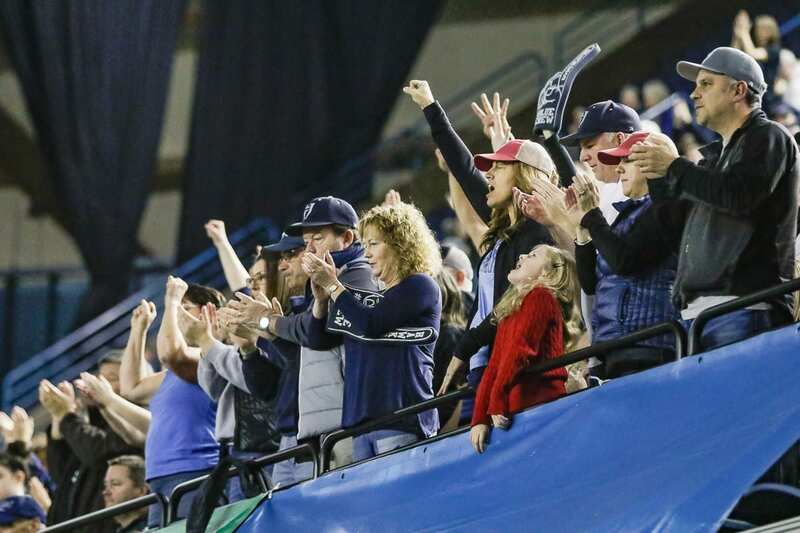 Hockinson went 61 yards on nine plays, with Racanelli cashing in on a 1-yard touchdown run with 6:35 to play, giving Hockinson a 35-31 advantage. Another turnover doomed the Lions. They muffed the kickoff, and Niko Niehaus recovered the ball for the Hawks. Guess who scored again? Racanelli’s 12-yard run gave the Hawks a 42-31 advantage. Lynden got in the end zone once more with 2:42 remaining but did not recover the onside kick. 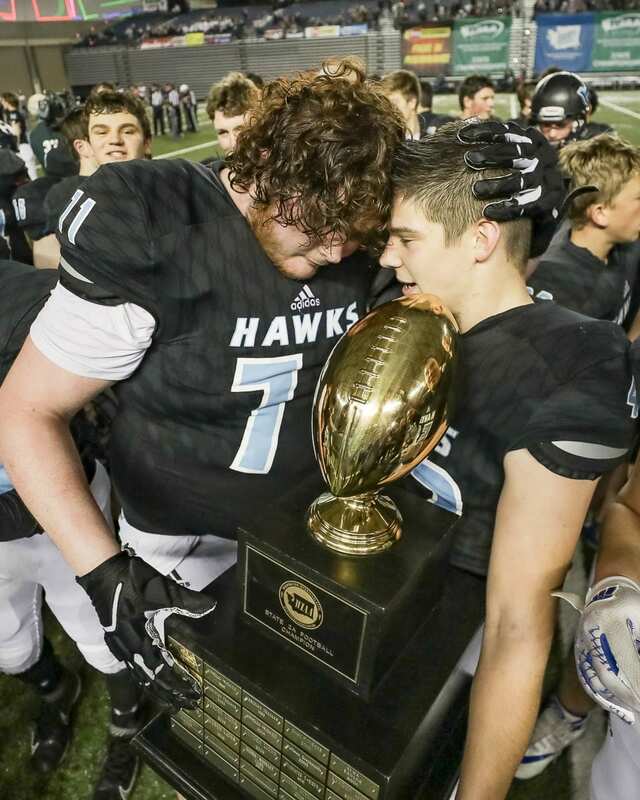 It was winning time for the Hockinson offense. Run. Run. Run. Run. Run. All by Racanelli. Two first downs to secure the win. “We just had more heart,” Crum said. And make history for Clark County football. RUSHING: Lynden — Marsh 19-120, Trevin Melendez 8-30, Heppner 5-6, Team 1-(minus 3). Hockinson — Racanelli 15-85, Crum 19-70, Cody Wheeler 7-22, Makaio Juarez 1-12, Garrett Gundy 1-5, Jon Domingos 1-4. PASSING: Lynden — Marsh 7-16-1-107, Heppner 3-5-0-109. Hockinson — Crum 12-23-1-160, Racanelli 2-2-0-27. RECEIVING: Lynden — Heppner 6-95, Grant Vanderyacht 2-82, Marsh 1-27, Elsner 1-12. Hockinson — Racanelli 5-55, Jeremy Faulstick 3-60, Liam Mallory 2-31, Wyatt Jones 1-16, Gundy 1-14, Crum 1-11, Wheeler 1-0.